I've always enjoyed dressing my kids up for Easter and spring in general but it seems like those cute outfits for Easter Sunday or the big egg hunt always go to waste after the fact. 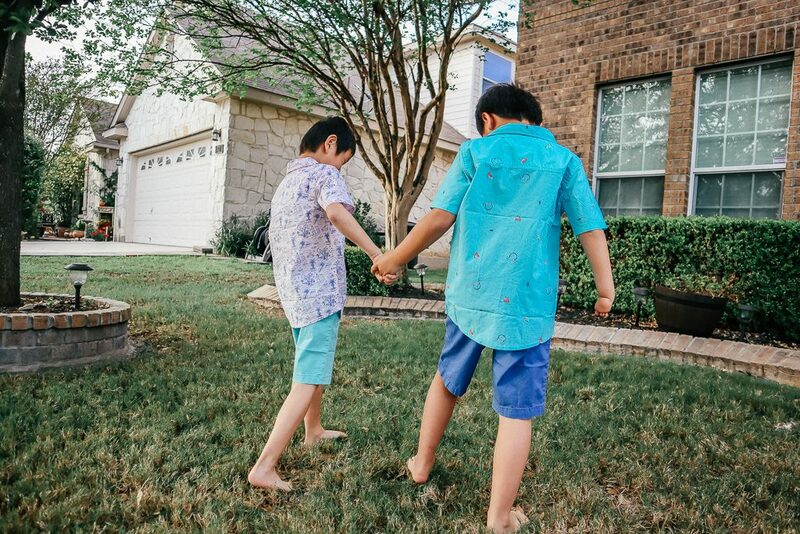 We're not really dress-up kind of people…once in awhile, my husband and I will fancy up and do something fun but our kids only dress up on special occasions and the clothes don't really get much mileage. I'm so excited at the haul I got from Carter's and I'm excited how far my dollars went. 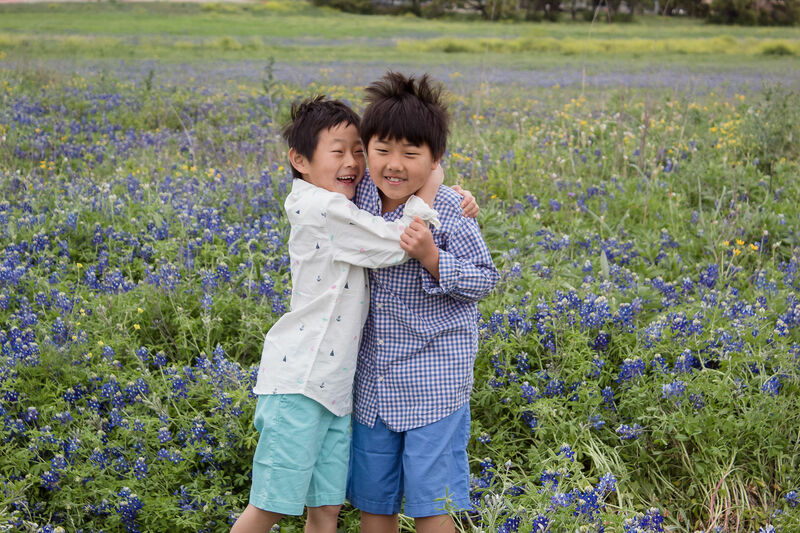 I can't wait to show you my best picks for Easter clothes for kids that fit us to a tee…in every way possible. This post is sponsored by Carter’s. All opinions are mine. I may earn a small commission if you purchase from the links in this post – thank you! 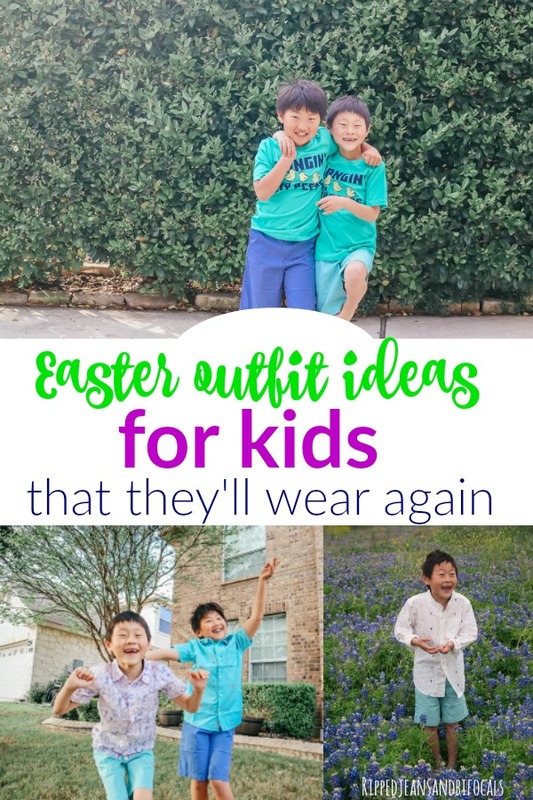 I like unfussy kids clothes that look sharp enough for those cute Easter pictures but that we can still get some everyday wear out of. I think I won here. I wanted clothes that coordinated without being too matchy matchy. I've never been a big “dress them alike” person but I do like them to coordinate. We've got the Stretch flat front shorts paired with the Gingham poplin button front shirt in pink and blue and the Sailboat oxford button front shirt. 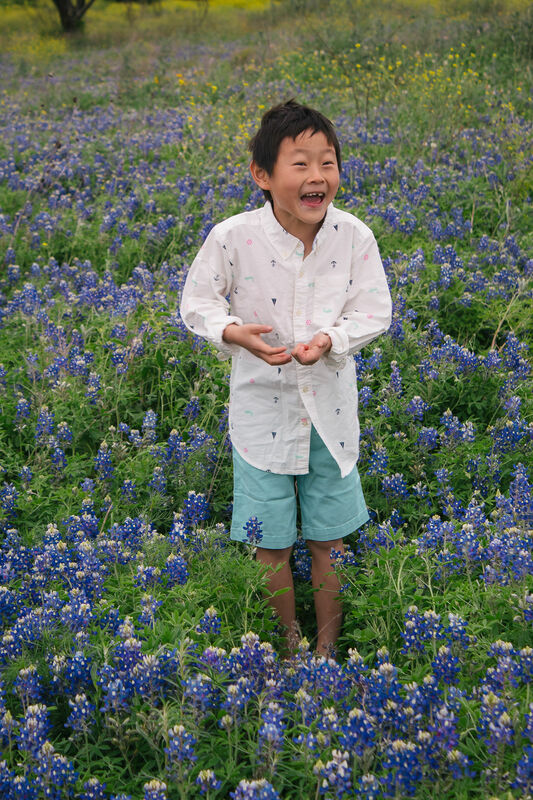 It was cold and windy when we went to do our Bluebonnet pictures – very un-Texas. The button downs can be dressed up with slacks, full-length khakis or even a blazer and tie. Carter's has some ADORABLE bow ties that coordinate with these shirts and I was so tempted because how stinkin' cute would these be with little bow ties? In the end, we decided ties were just not our style and that my kids might have used them for something they weren't designed for. We're very “every day is casual Friday” kind of people. The shorts can also be dressed down with a polo or even a tee shirt. Our kids wear shorts to school from about mid-April on, although it's colder this year than normal. These shorts will take my kids everywhere we need to go this spring and summer. We've got the shorts paired here with the Button front beach shirt and the Button front doodle shirt. This is a little bit more of a casual look but still great for an Easter egg hunt or a spring party. They're excited it's “bare feet” season. The “Doodle” pattern has headphones, lightning bolts and sneakers on it. The “Beach” pattern has surfers and fun slogans on it. 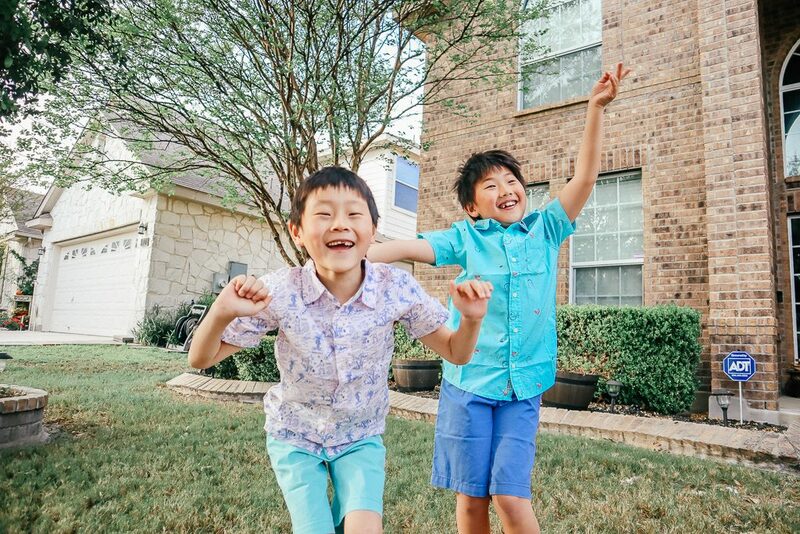 My kids love the whimsy and that their shirts resemble their dad's loud Hawaiian shirts. 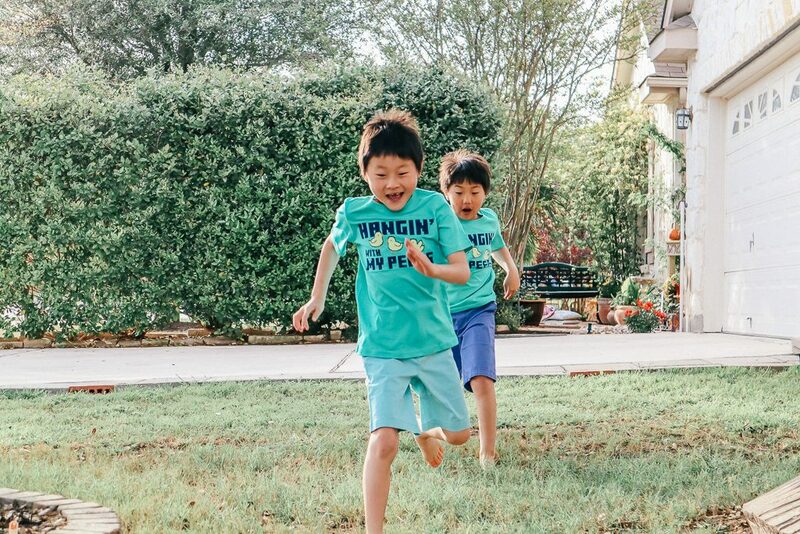 These are fun shirts for spring that my kids will wear into the summer. 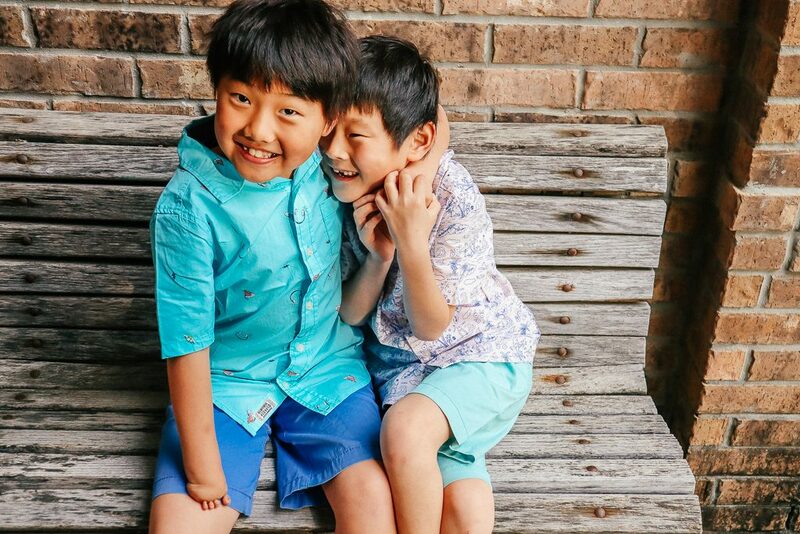 There are also coordinating prints in infant bodysuits and girl's clothing if you're looking to match a group of kiddos without looking too matchy matchy. It doesn't have to match, it just has to go. 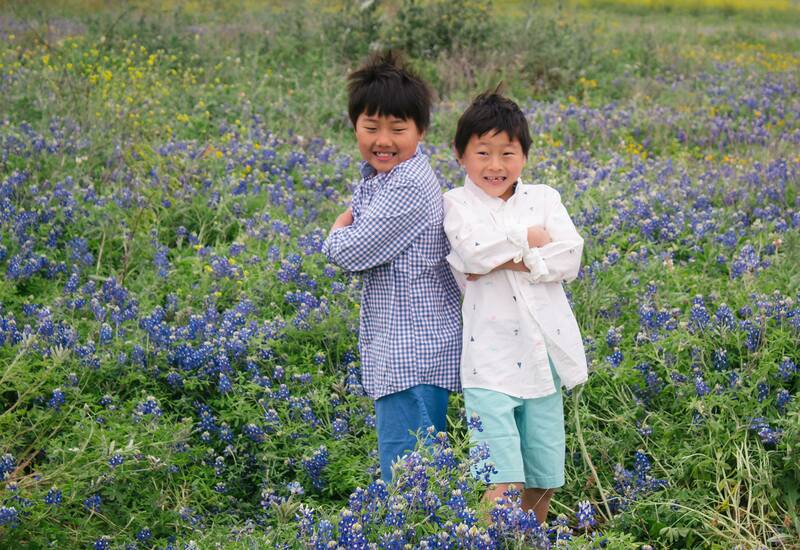 “Just smile, don't put your brother in a choke hold.” Things I say when taking pictures of my kids. 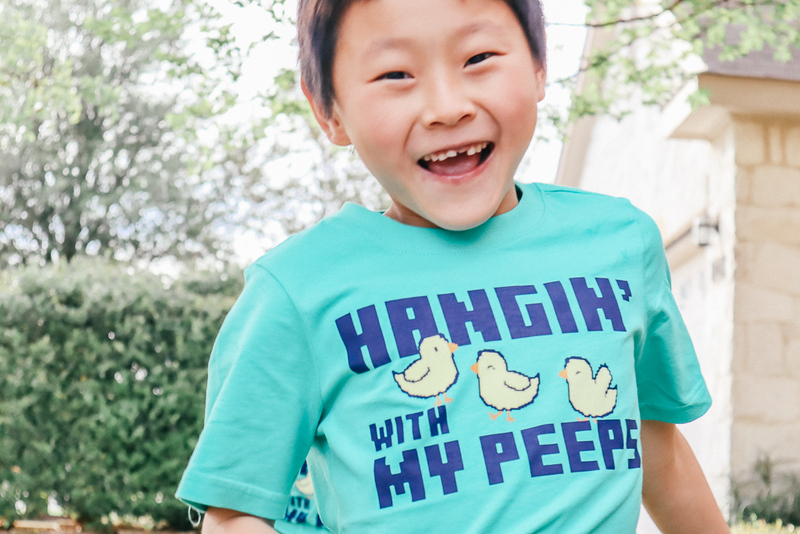 If you want to go ultra casual, you can get these “Hangin' with my peeps” jersey tees. If you're not a “dress up for Easter” sort of person, this is a fun and casual option. But what we're MOST excited about? We're going to have a very special visitor in about a week. In addition to the fun tee shirt, we got him an Easter outfit to coordinate with Zack and Kyle: we chose the Striped poplin button front shirt and the Schiffli flat front shorts . I bet you can't wait to see the picture – we can't either! If you're looking to outfit and coordinate different sizes of kids, Carter's is your place, man. I've found tremendous deals on Carter's websites and in their stores. Something is always on sale. I love the convenience of shopping online because of course I do. I love the service and selection and deals I get in the Carter's stores. They have a loyalty program that can be used in store or online, they ship fast, and you know what else? Their stuff LASTS. You can also order online and have your merchandise delivered to a Carter's store. My boys have worn Carter's all their lives. My daughter wore Carter's for many years. Now she has her own son and guess what I buy him? Yep. Carter's. I can order stuff for my grandson online and have it shipped directly to my daughter. It doesn't get easier. Clothes go out of style and kids grow out of clothes but these clothes don't wear out. They really don't. When you log on to the Carter’s website, you can also jump back and forth between that site, OshKosh B'Gosh and Skip Hop. If you order from both Carter's and OshKosh B'Gosh you can have your order delivered in one packaging, which is really convenient.